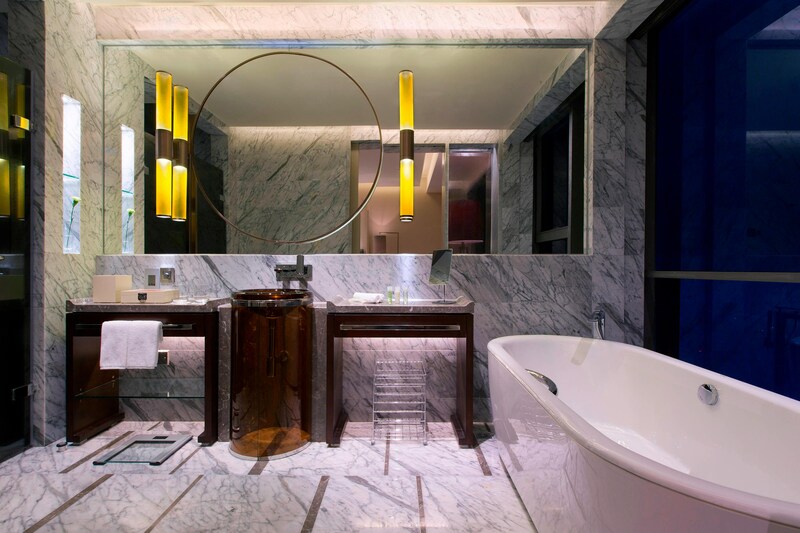 Situated in the heart of the city, we are located in the central business district, just steps from the famous Tianyi Square&apos;s dining, entertainment and shopping. From gourmet restaurants to unique local shops, a remarkable experience awaits. Impress attendees with our nearly 6,000 square meters of refined meeting and banqueting space, suitable for all occasions. 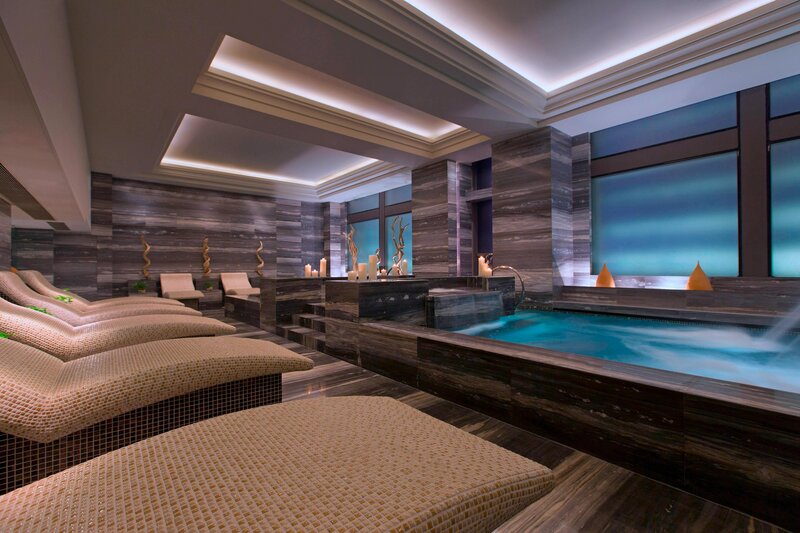 Then find relaxation in our Heavenly Spa by Westin™, or get moving in our Westin WORKOUT® Fitness Studio, open 24 hours a day, 7 days a week. Dine in our restaurants and bars serving delectable, nourishing cuisine including our classic Chinese restaurant Five Sen5ses or our modern Japanese teppanyaki house Mai. Our modern hotel comprises 310 stylish guest rooms, including 35 suites, all with LED TV and high-speed internet access for great leisure. The Westin Heavenly® Bed and bathroom with windows ensure you always feel your best. The Westin Ningbo promises to become the city’s new benchmark for sophisticated meetings, events and weddings with a total space of over 6,000 sqm. Contemporary spaces and audio visual technologies set the tone for Ningbo’s new banquet facilities. You will be amazed by our more than 20 individual beautiful function rooms. Our hotel features 310 contemporarily designed river view rooms, which are a minimum 46sqm in size, with modern facilities and world-renowned Westin Heavenly® Bed. Open to guests of Westin Executive Club Rooms and Suites, the Westin Executive Club Lounge is the ideal space for enjoying breakfasts and snacks, and a subdued yet social atmosphere set against stunning river views. 6 distinctive restaurants and bars provide a range of delectable and nourishing cuisine, as well as places to retreat and relax. Five Sen5es is the perfect setting for enjoying a range of delicious Chinese dishes made with authentic ingredients in an exquisitely tranquil environment. Experience the distinctive allure of authentic Japanese cuisine. Savor delicious international fare buffet-style or à la carte and watch our talented chefs at work in the interactive, open kitchens. Enjoy a refreshing drink with friends in the Lobby Lounge, an upscale yet soothing space. 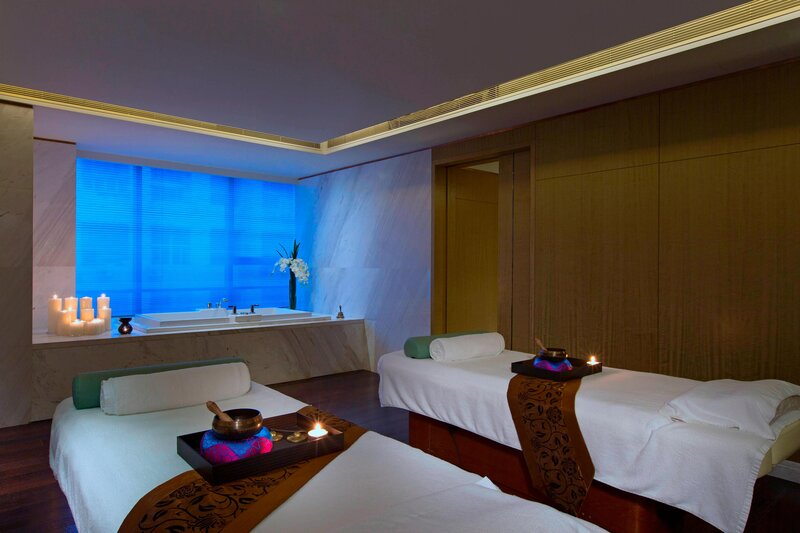 Located on the sixth floor with views of the city, our Heavenly Spa by Westin™ brings a blend of Western and traditional Chinese techniques. Our methods elevate every treatment to a sensory ritual that helps expel fatigue and stress while nurturing balance and calm. A peaceful sanctuary, our spa welcomes you with uplifting green and white décor accented by live plants, natural stone and wood, and indoor ponds. 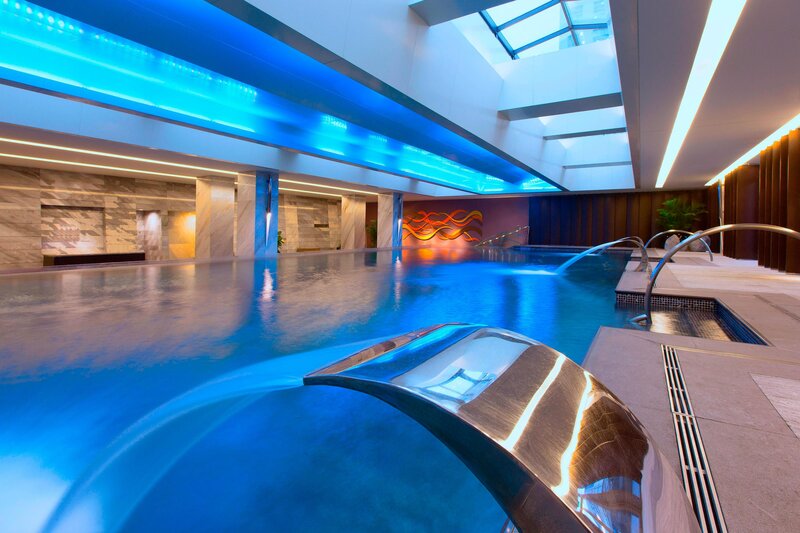 Spa facilities include seven single treatment rooms, one couples&apos; room, and one Vichy shower. Westin WORKOUT® with array of cardio equipment—including treadmills, stationary bikes, and elliptical machines—lets you work out at your own pace and features individual TVs and iPod jacks for an upbeat exercise routine. 25-meter infinity pool featuring transparent glass on three sides—beckons with comfortably heated water. Take advantage of our fully-equipped WestinWORKOUT® Fitness Studio to stay fit and feeling your best during your travels. This state-of-the-art facility is located on the sixth floor, with windows for natural light and stunning city views. 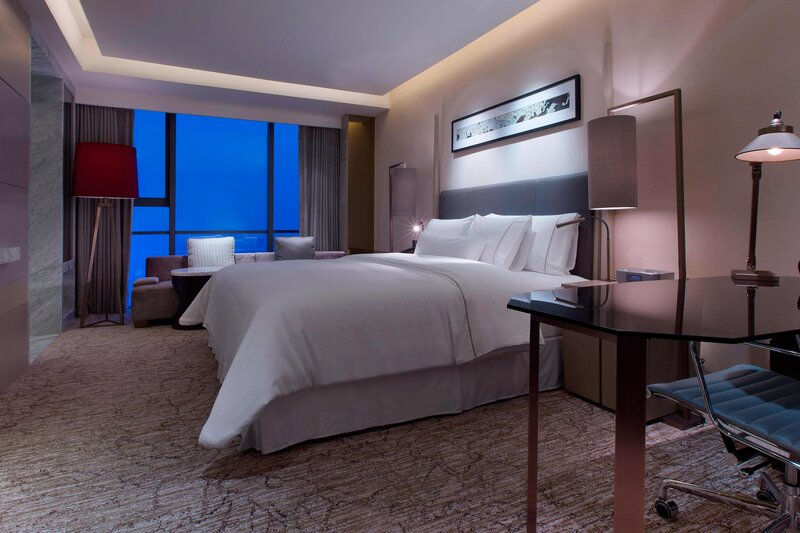 The Westin Ningbo is situated near the Fenghua River in the city’s Central Business District—steps from Tianyi Square’s myriad restaurants, entertainment, and shopping. Ningbo is one of China’s oldest cities, with history dating back to 4,800 BC, and many of Ningbo’s historical attractions are found close by.